Two photography exhibitions in Switzerland put America under the spotlight. 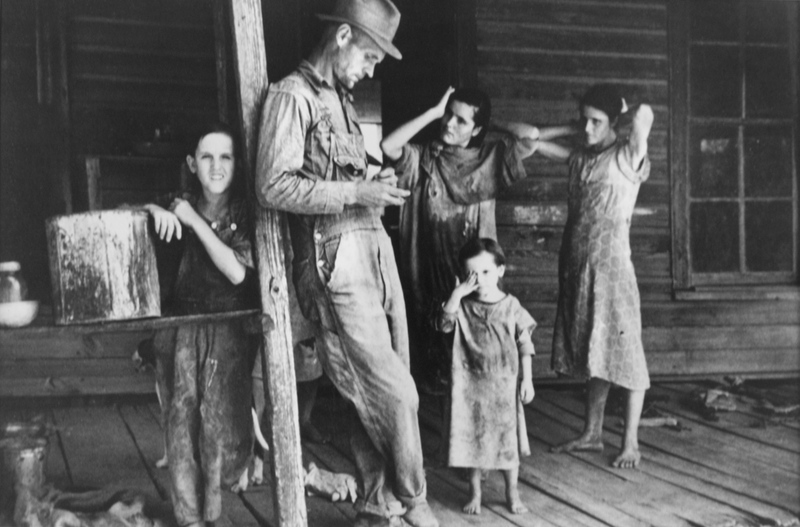 In Fribourg, a collection of pictures taken in 1935-42 by the greatest American photographers of the time documents the destitution of American farmers hit simultaneously by the Great Depression, draught and industrialization. In Bienne a young German photographer mixes Hollywood fiction with real life scenes captured in the natural decor of Los Angeles. From famine to fantasy, two unrelated exhibitions in Fribourg and Bienne offer stark images that are not dissimilar in their portrayal of the darker side of the United States. But because they tell stories, they do not make us feel miserable. 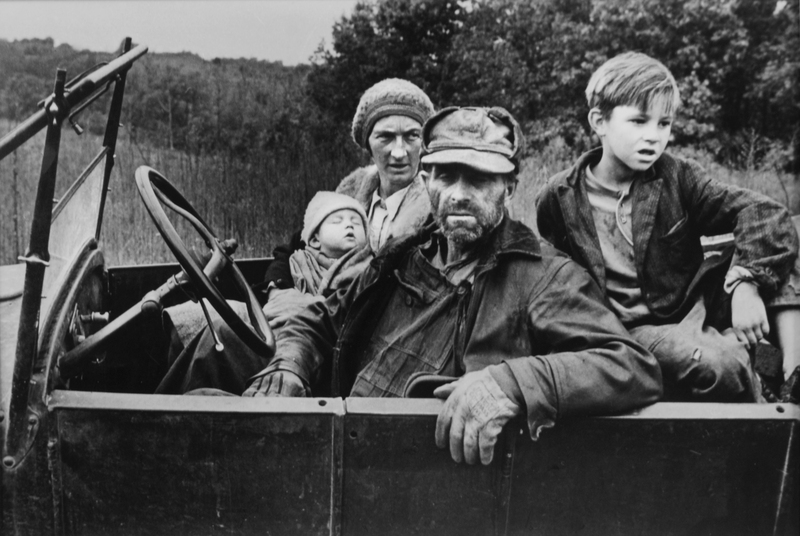 “The convergence of the Great Depression, a severe draught and the arrival of tractors meant that those who lived in the food cradle of the US in the thirties and early forties were too poor to eat,” explains Emmanuel Schmutz, curator of The Bitter Years (Les années amères de l’Amérique en crise) at the University of Fribourg Library. 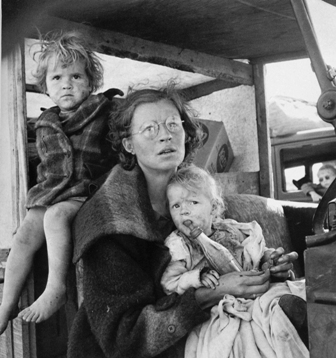 From 1935 to 1942, the Farm Security Administration created by Franklin Delano Roosevelt during the New Deal to support the devastated agricultural sector commissioned the biggest names in American photography to document the dramatic situation. It was the first time that photographs were used as a political instrument to alert public opinion. The powerful imagery inspired The Grapes of Wrath, according to John Steinbeck who wrote his masterpiece in 1939. Some 270’000 images were taken during the campaign by photographers infused with compassion who were sent out on the agricultural trail, including Walker Evans, Dorothea Lange, Ben Shahn, Russell Lee, Carl Mydans, Marion Post-Wolcott, John Vachon, Arthur Rothstein and Jack Delano. 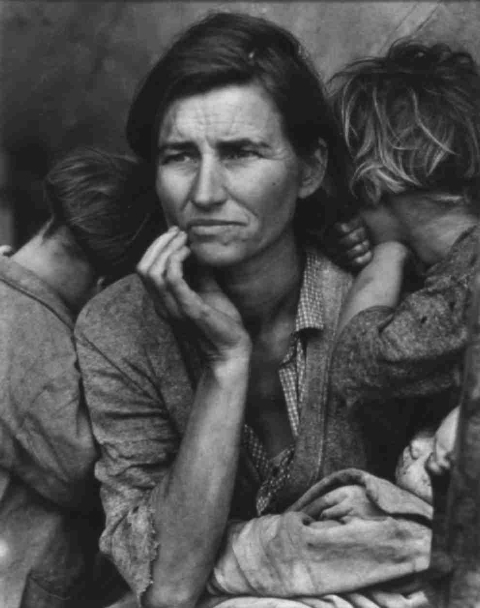 Out of 77 photographs on display in Fribourg, some already belong to our collective consciousness, notably Dorothea Lange’s Migrant Mother taken in California in 1936. 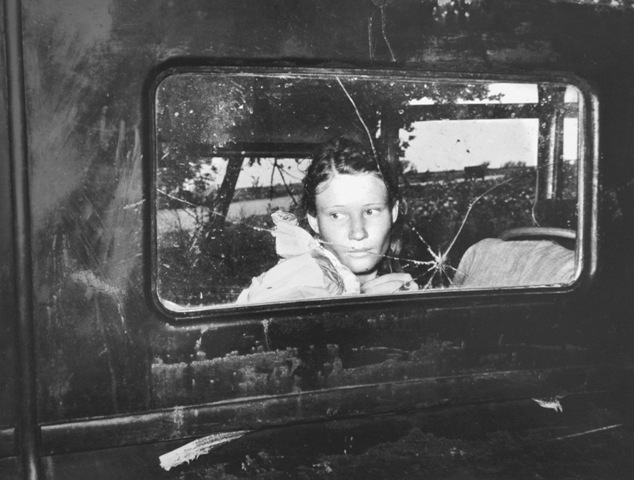 According to Schmutz, Lange was on her way back home after a long day when she passed a sign indicating a migrant camp but she carried on. Thirty miles later she turned back. She stayed only ten minutes in the camp, but the photograph that she took of a migrant widow was to become a universal icon of a modern day Madonna. It was also to cause a lot of grief when the little girls in the picture, now grown up, accused Lange of capitalizing on misery. However, when their mother, Florence Thompson, was dying of cancer in 1983, a nation-wide campaign led by the New York Times allowed the necessary funds to be raised to meet the medical expenses that she could not afford, although it was already too late. In Bienne, another reality meets the eye. L.A Crash at the CentrePasquArt presents scenes of cops, car chases and imminent disasters but we are never told whether they are real or fake. 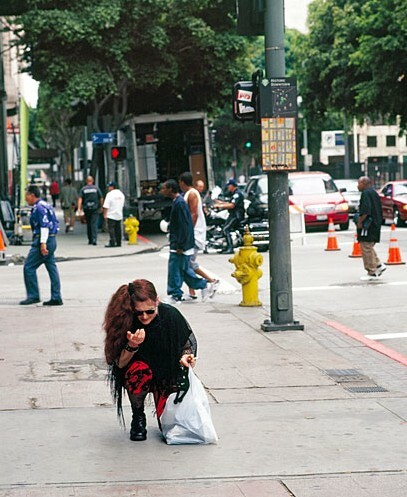 Mirko Martin is the Berlin-based photographer so intensely fascinated by Los Angeles, the underbelly of Hollywood, that he has woven a bizarre visual web that is almost impossible to identify as fact or as fiction. “It is precisely this ambiguity that interests us” says Daniel Mueller, director of PhotoforumPasquArt in Bienne/Biel, where the exhibition was launched this weekend and takes place until 14 March. “But then again skepticism is part of the process of confronting images” he adds. 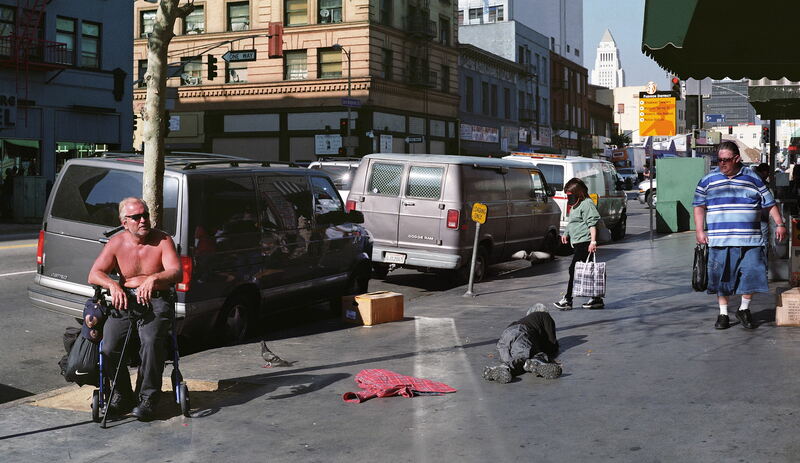 Under the bright sunshine of California, people loiter on sidewalks ignoring cadavers, cops arrest a young kid, a woman tramp kneels pathetically in the street. Life goes on. “What continues to attract me to a part of the world that I first discovered on a Fulbright scholarship is the constant flux between utopia and dystopia,” Mirko Martin said. “By working at the threshold between reality and fiction, by integrating film sets and scenes into my pictures, or fictional situations into natural décor, the objective is to intensify the L.A. experience,” Martin explains. Ironically, one of the most intense pieces on display in the exhibition is not even a photograph. A black screen delivers the transcript of the broken conversation that we can hear against the sound of hovering helicopters. 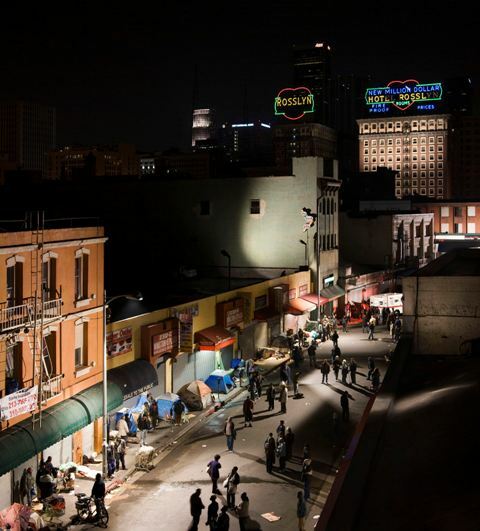 It is taking place at night at the scene of a police shootout in a gang neighborhood of Los Angeles. There are different worlds colliding in the streets of L.A., people from so many different ethnic backgrounds, says the artist, emphasizing that “This tension, I am convinced, generates the great American energy”. Working also with video, his latest work is a full hour documentary on the street story of a homeless man in L.A. who lost his family in the 9/11 attack. “My main interest is people” Mirko Martin admits. Two other exhibitions take place at CentrePasquArt at the same time: the enigmatic references to TV by Swiss photographer Mathieu Bernard-Reymond, with a display simply entitled Mathieu Bernard-Reymond TV and a Swiss delirious combo that operates under the name Com&Com (commercial communication) with the show Com&Com – La réalité dépasse la fiction (reality is often stranger than fiction).